The scope without an equal! 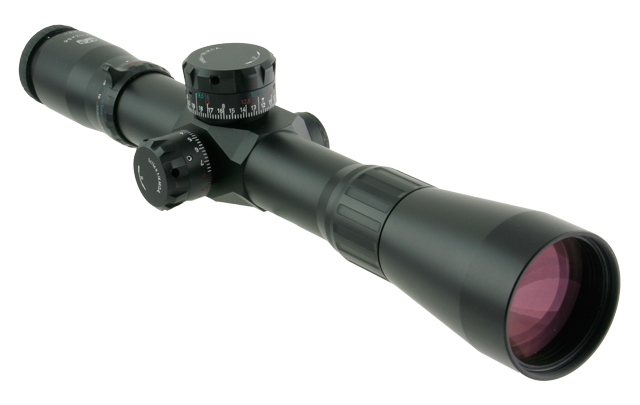 The all new 40mm 12-52x56 Terminator is the scope that none can compete with! This marvel of optical engineering boasts the following new and innovative features: low dispersion "ED" Schott Glass. Magnification detents @14.4x (for Mil readings) and 26x (for MOA readings), the incredible mid tube parallax adjustment offers a crystal clear image as close as 21 feet @ 52x power. Optional, interchangeable BDC turret rings for .338 LaPUA AND .50 BMG. digital illumination with auto shut-off. Fast focus eye piece adjustment and 100 MOA of travel, all on a 40mm tube. Rings and sunshade included!